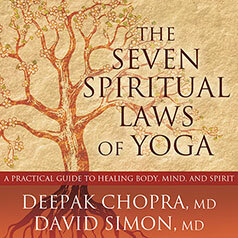 In this must-listen book, Deepak Chopra, MD, and David Simon, MD, show how the Seven Spiritual Laws play a crucial role in yoga's path to enlightenment while providing listeners with a wealth of meditation techniques, mantras, breathing exercises, and yoga poses. The remarkable benefits of yoga, which include improved flexibility, balance, muscle tone, endurance, and vitality, only hint at the extraordinary power of this deeply spiritual practice. When adhered to and practiced mindfully, yoga can unlock your full creative potential, capacity for love and compassion, and ability to find success in all areas of your life. The Seven Spiritual Laws of Yoga brings spirituality back to yoga. It shows how the Seven Spiritual Laws play a crucial role in yoga's path to enlightenment while providing listeners with a wealth of meditation techniques, mantras, breathing exercises, and yoga poses. Whether a newcomer to yoga or an experienced practitioner, The Seven Spiritual Laws of Yoga is a portal to yoga's deeper spiritual dimension and a beautiful step to a happier, more harmonious, and more abundant life. You can’t view any supplemental PDF materials before you buy The Seven Spiritual Laws of Yoga. If you purchased it elsewhere, please enter the access code provided in the beginning of the audio to view the supplemental material. All access codes should be entered in lowercase letters. PDF software is required to view the supplemental PDF.